I tried to learn to drive with a previous instructor before a friend recommended Steve to me. The previous instructor I did not enjoy my lessons with and did not push me to my best ability. This was wasting my time so when I was recommended to Steve, I had to contact him! 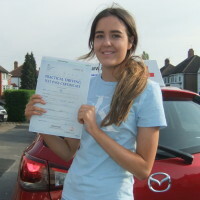 I never believed that I would pass my test but Steve gave me the confidence to keep on going, making me feel comfortable and at ease helping me to become a confident driver. He remained positive and gave me useful and constructive feedback every lesson, helping me to pass my test. I couldn’t fault him and without his positive attitude, I wouldn’t have been able to have pass my driving test, he is a great instructor and I would recommend him to anyone!